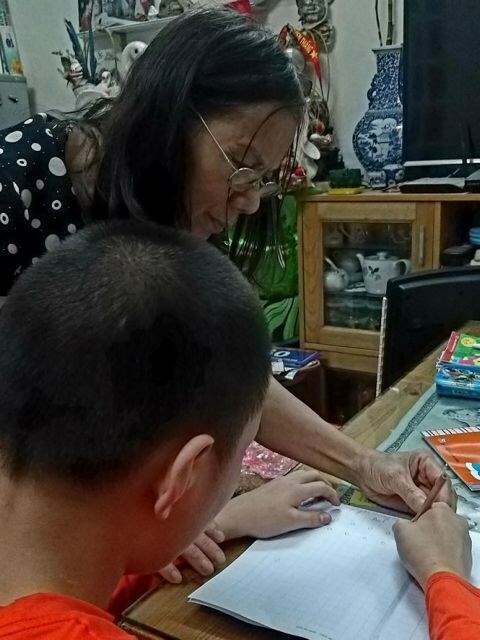 Hanoi (VNS/VNA) - A retired teacher living on Hanoi’s Kham Thien street, Dao Ngoc Huan has become well known among her community for helping disadvantaged children. For the past two years, every afternoon at 4pm, Huan picks up an autistic boy from school and teach him how to read and write at her house. From not being able to write a single letter, thanks to the old teacher’s help, he is now able to write neatly. He is one of many autistic students taught by teacher Huan for free. All of them call her “mother”. She calls them “special angels”. “I have not been through any training to teach children with special needs. I have collected knowledge through books and real experience,” she told Tien Phong (Vanguard) newspaper. “The class is free. Parents give me small amounts of money to pay for petrol or xe om (motorbike taxis) to pick up children at school,” she said. The 70-year-old woman taught at primary schools in suburban Hanoi for more than 20 years and has many students who found success but some of them still struggle. She remembered one night when her drug-addicted student could not sleep and suffered from shock. Huan has so far helped rehabilitate three of her students who were addicted to drugs. Other students came to her house and confessed that they were addicted and asked for help. Not only a teacher for autistic children and a helper of drug addicts, Huan is the adoptive mother of children abandoned by their parents. Knowing Huan’s kindness, a mother brought her baby and asked Huan to take care of the baby for a while. The mother never returned. Huan brought up the baby and named her Hoang Yen. When the girl was about to go to kindergarten and needed a birth certificate, Huan went to find her father. Through the mother’s story, Huan knew the address of Yen’s father and found him. It turned out that Yen’s grandparents did not agree with the couple’s marriage. Her mother had to abandon her. After finding Yen’s father, Huan knew that he was looking for his daughter too. Now Yen has grown up and got married. Huan was born in northern Thai Binh province, her father’s hometown and at early age lived without her mother’s care. Her paternal grandmother was the only care giver. Huan herself is a single mother and brought up two children by herself. “I care and love miserable people because I myself suffered from misery too,” Huan said. Living on humble retirement wage of 3 million VND (127 USD) per month, Huan still saves money for charity. Not long ago, she spent 26 million VND (1,106 USD) from her savings to buy a piano to teach autistic children.